We are open to the public. Visit Us at our farm just North of Bradford for quality trees at quality prices. Our professional staff is available to help you choose from our many varieties of trees. Count on us to help you choose the right trees for your landscape needs. We will deliver and plant your trees for you. All of our trees are fully guaranteed. The majority of our trees start as small whips or seedlings. We then grow our trees for 5-15 years before they are ready to transplant. During this time, they are contsantly weeded, pruned and fertilized so they are able to mature into the healthy trees we provide. Once matured, the trees are dug with a hydraulic spade and placed into a burlap sac within a wire basket for transport. Because of the growth cycles of the tree, alternating between root and leaf/branch growth, trees can only be dug during the spring and in the fall. 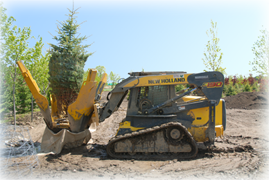 During April and May, we dig all the trees we need for the season and they are put into our sales yard. The sales yard is open to the public, so feel free to make an Appointment and come have a look at our stock.